A Hearthstone game can last for 90 turns, but sometimes the game is decided with the first decision that you make - which cards to keep in your opening hand. 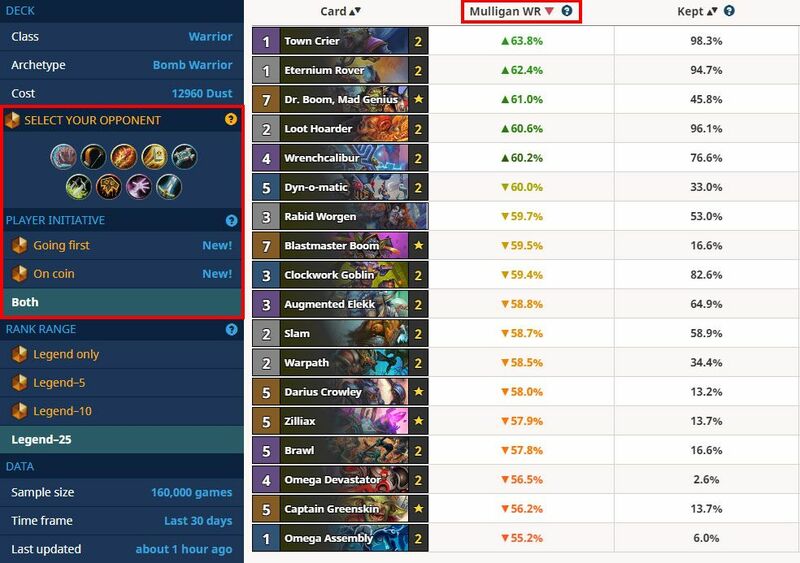 Our data shows that which cards you choose can swing your winrate by as much as 5-10%. In this article, we'll teach you how to use your instincts, plus the information on HSReplay.net, to make better mulligan decisions that will maximize your advantage against each specific opponent. Every game of Hearthstone starts the same way. Each player draws a number of cards as their starting hand (three if you're going first or four plus The Coin if you're going second). 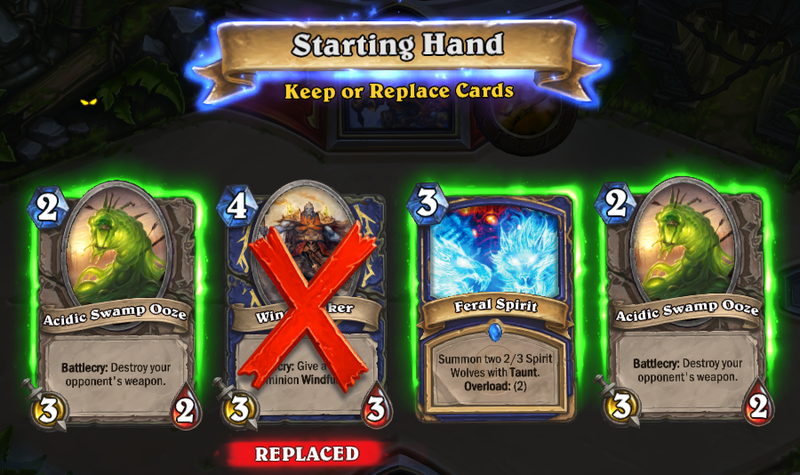 The first strategic decision in a game of Hearthstone is choosing how many and which cards you should keep or mulligan. It's no surprise many players have a hard time with mulligans. The right cards to keep depend on your opponent's class and whether you're going first or second. To help with your decision we created the Mulligan Guide on HSReplay.net. By aggregating data from millions of games and hundreds of thousands of Hearthstone players, we calculate which cards yield the highest winrates versus each different class when kept in your starting hand. In this article we'll use the popular Bomb Warrior list to highlight the nuances of how you should mulligan differently based on which deck you're currently facing. The Bomb Warrior deck gets its name by using cards that shuffle Bombs into your opponent's deck. This includes cards like Clockwork Goblin, Wrenchcalibur and sometimes Seaforium Bomber. Most lists also include synergy cards like Augmented Elekk to shuffle additional Bombs and Blastmaster Boom to summon Boom Bots. But shuffling Bombs into your opponent's deck is far from the deck's only win condition. 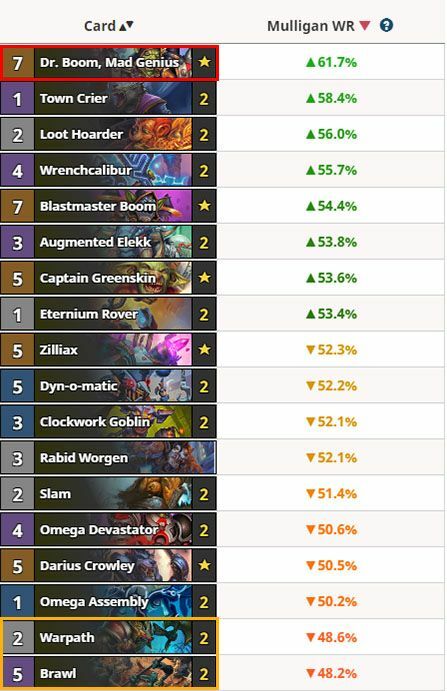 Against aggro decks like Tempo Rogue, the deck usually wins by stabilizing the board and eventually regaining tempo. 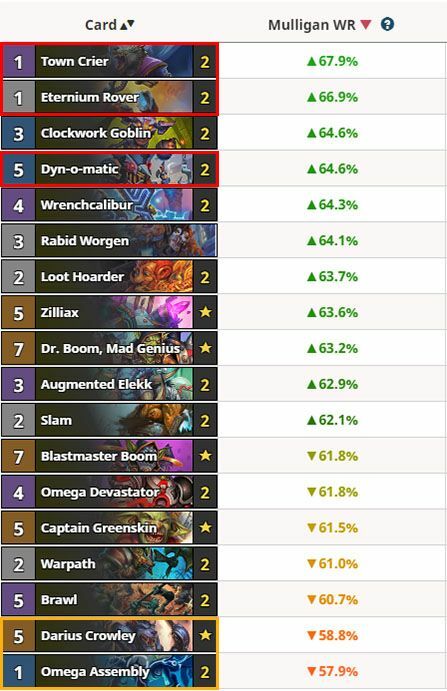 Whereas against other control decks like Control Warrior or Control Shaman, it usually wins in fatigue. Let's take a look at how to mulligan optimally against some of the most popular classes and archetypes currently in the meta. 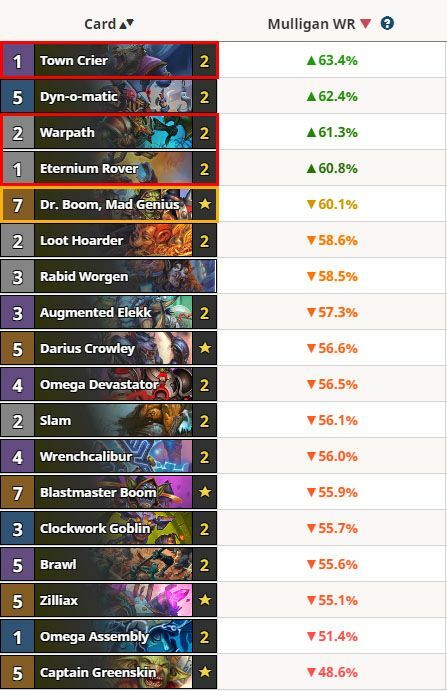 The most popular Warrior archetype in most ranks of play right now is Bomb Warrior, followed by Control Warrior. These are the decks you should keep in mind when making your mulligan decisions. As these are usually long and grindy matches that tend to end from fatigue damage, the most important card to keep in your mulligan is by far Dr. Boom, Mad Genius. Playing it on curve can give you a huge lead. On the other hand, area of effect cards (AOE for short) like Brawl and Warpath have very little impact in the match and are often played just to clear space in your hand. 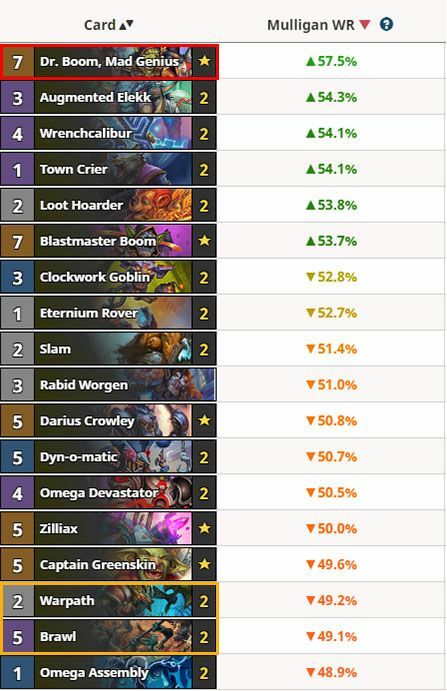 Tempo Rogue is another one of the strongest and most popular decks in the Rise of Shadows meta. 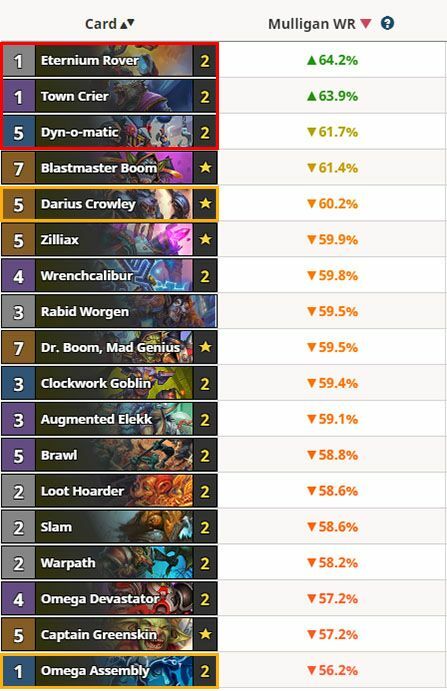 With a 56.4% winrate against Tempo Rogue as of this writing, Bomb Warrior is usually favored in this matchup. As Bomb Warrior, your main goal is to stabilize the board and regain tempo while keeping your life total as high as possible. This makes cards like Eternium Rover, Town Crier and Dyn-o-matic great to keep in your starting hand, while other cards like Omega Assembly just don't do enough in the early game to justify keeping. Other cards, however, can vary greatly depending on whether or not you have The Coin. Take a look at Darius Crowley for example, which has the second lowest mulligan WR if you're going first (left) but one of the highest if you're on coin (right). The last deck we will highlight is Token Druid. 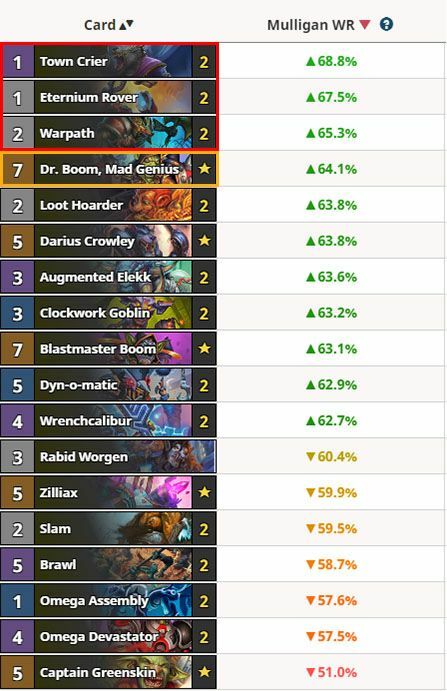 With the archetype currently representing over 80% of Druid decks on ladder, it's safe to assume you will be playing against it when facing a Druid. Cards like Town Crier, Eternium Rover and Warpath are great to keep in your starting hand regardless of whether you're playing first or second, as they help you challenge the Druid's board early on. Warpath specifically is crucial in the mid to late stages of the game as it allows you to clear your opponent's board even after they play Soul of the Forest. However, a card that might feel counter-intuitive to keep is Dr. Boom, Mad Genius. You usually don't want a late game - and arguably slow - card in your starting hand. But in this case, two of Dr. Boom's hero powers (KABOOM! and Micro-Squad) are extremely effective against token style decks. No matter which deck you're playing, you can find all the information from this article and all the mulligan stats you need directly on HSReplay.net. Once you've navigated to the deck detail page for your list, click the "Mulligan WR" header to sort the table by that column. Then use the opponent player filters on the left hand side to select the class that your opponent is playing. Then use the player initiative filters, also on the left hand side to select whether you're on the coin or first to play. The cards displayed at the top of the table will be the most important ones to keep in your opening hand. Use this information to optimize your play and breakthrough to the next rank. Subscribe to Premium today to access the full breadth of stats from HSReplay.net, including mulligan guides, meta filters, personal statistics and more. And don't forget to follow us on Twitter and Facebook for daily Hearthstone stats!